My wife and I made this birthday cake for my mum years ago. It was kept hidden until the last moment and then brought it out; everyone loved it right down to the last bite. The cake covering, table cloth and decorations are all made from plain store bought almond paste tinted with liquid food colouring from the grocery store. We made a Battenburg cake the first day and then assembled it and made the decorations the next day. The birthday dinner consists of a salmon steak with lemon wedge, peas, carrots, a baked potato with a pat of butter and even a sprig of parsley all served on an almond paste plate. 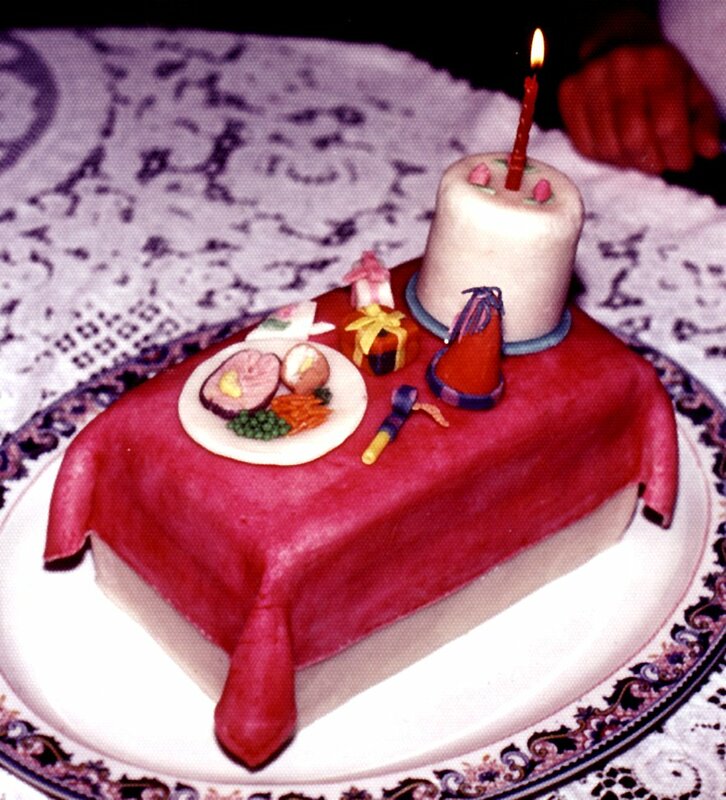 The other items on the birthday table are a napkin with rose decoration, a party blow out, a party hat, two gifts and another real birthday cake on an almond paste plate decorated with 3 roses and its very own candle. Here is the recipe for home made uncooked almond paste. I have tried both the cooked and the uncooked almond paste and prefer the uncooked.I don't take it on to the marzipan stage because I love the taste of fresh almond paste. I LOVE marzipan but there is so much more sugar and the paste is cooked. Freshly made almond paste doesn't taste anything like the store bought variety, it is amazingly good. Soak the 3 tablespoons of meringue powder in the 6 tablespoons of water. I don't use fresh egg whites because of the possibility of salmonella poisoning. 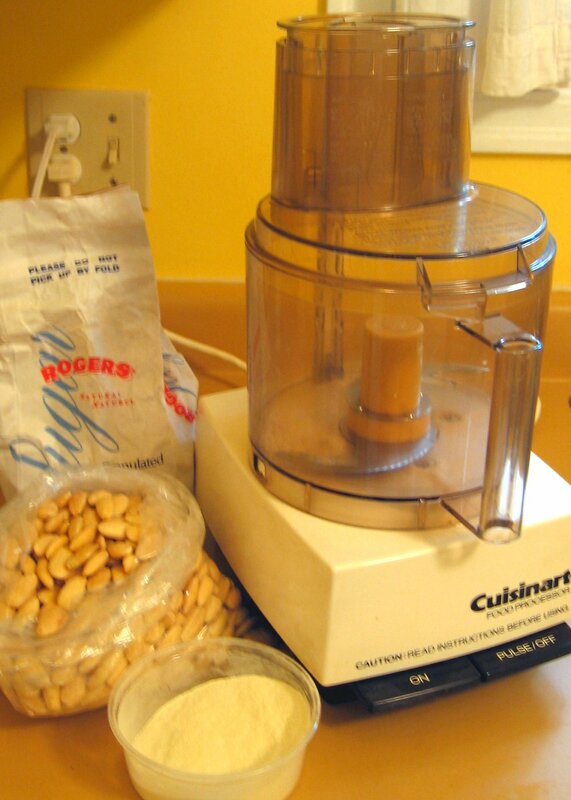 Grind the 6 cups of almonds in the food processor and then add the sugar. Grind the almonds and sugar until they fully blended together. Pour all the ground almonds and sugar into a large bowl. Add the meringue liquid. Start kneading all of the ingredients together. 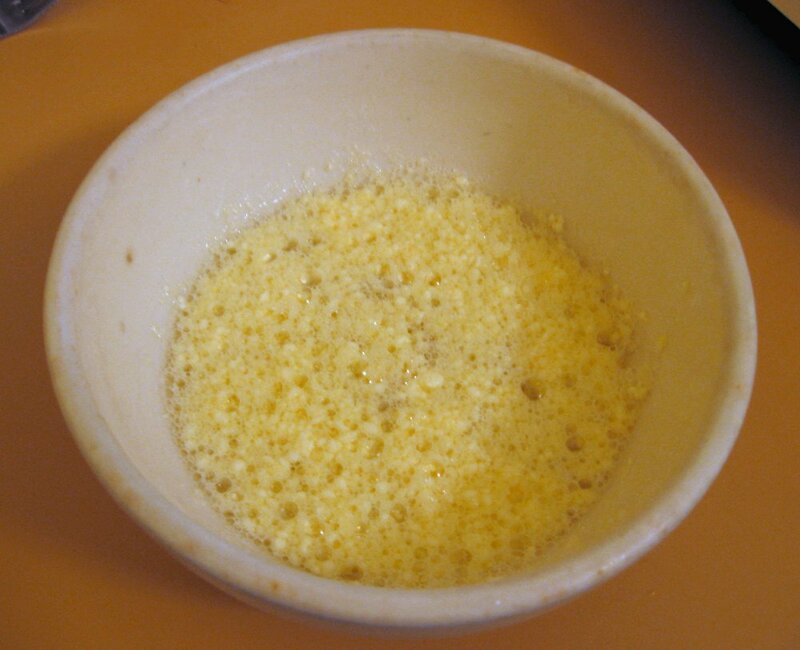 It will be a little granular but don't worry and start adding more liquid, be patient. 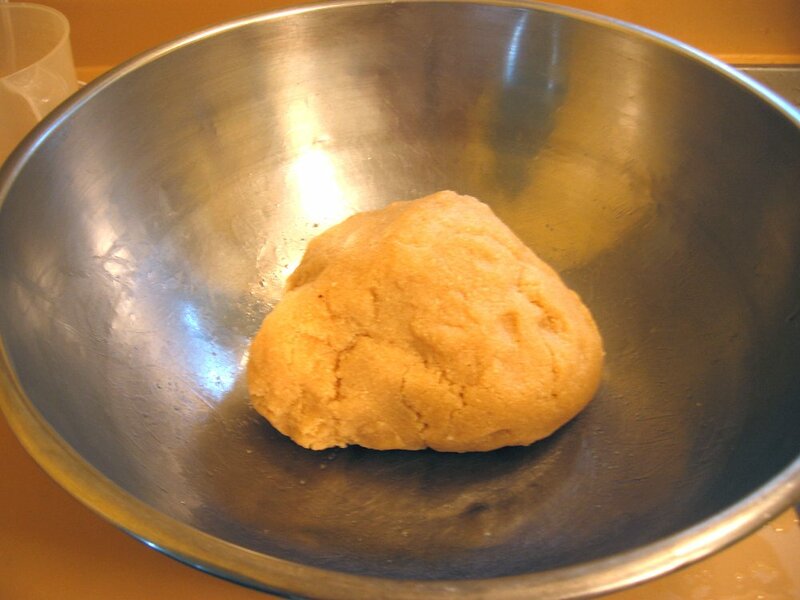 If after kneading for a few minutes and it is still a little crumbly add a teaspoon of water, continue kneading for a few more minutes. I had to add water into the mix twice but only after kneading for a while between each addition. The oil from the almonds will also be released and help to bind everything together. Don't let the almond paste get sticky by adding too much water, always err on the side of caution, better safe than sorry. 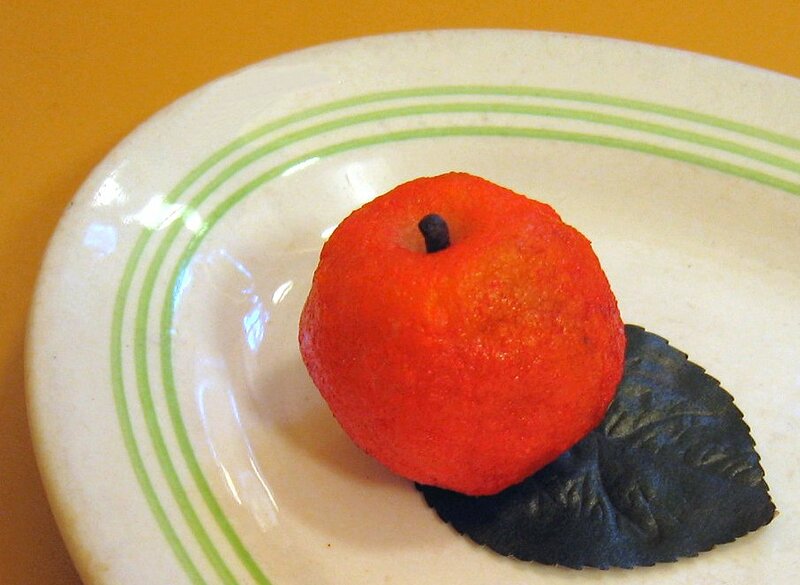 This little piece of fruit was supposed to be an apple but with the addition of the yellow paste food colouring on top of the red it looks more like a mandarin orange, so that is what it is a mandarin orange. I made the shape of the piece of fruit and then dipped my fingertip in the colouring and rubbed it on the outside of the fruit. I then dipped my finger in some water and then rubbed my fingertip on the fruit to blend it all together. I don't usually colour them this way but I wanted to do it quickly so that I could photograph it to show you what it would look like. So there we go the very best almond paste that you will ever have tasted, so fresh, rich, and creamy. LEN!!! - you are CRAZY - but in such a good way! I love the tiny table with the meal - so wonderful. 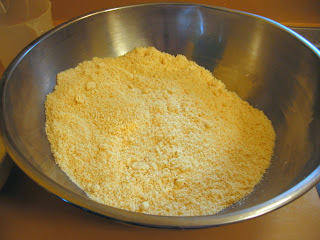 OK - I will take you up on the challenge - I will be making some Almond paste for my son's birthday cake! You are so talented - I just love reading your posts! Ok - I have to comment again, I just got through reading some of your older posts - the holiday decorations are TO-DIE-FOR! closeups - I NEED closeups! oh - and the candy in the bowls - LEN - I MUST see what you are doing with that - did you hear the squeals of excitement from Phoenix Arizona? I AM CRAZY! well this from a sugar junkie! Thanks so much for the pats on the back. All of the pictures that I post are fairly large and for a better look just click on the image. You will have to wait to see that candy in use in a major way, my next post will explain. I did use one small marzipan tablet though.